Born and Raised in Modena, Italy, in a family with a strong culinary heritage, Chef Andrea Benatti learned to cook and to appreciate the land from his grandmother. 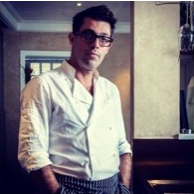 After achieving a degree in agriculture sciences, Andrea began his life in the culinary world, ultimately becoming an executive chef, owner, and CEO of restaurants in Bologna, Key West, Boston, Bahia, and Shanghai. Throughout his culinary career, Chef Benatti’s cuisine has received high praise from the Boston Globe, the Boston Herald, the Boston Phoenix, and has been rated “Extraordinary” by Zagat. With his recent return to Key West, Chef Benatti has taken over the duties as Chef for the Point 5 Tapas & Wine Bar.